On May 16, SNU President Sung Nak-in presented the Spring 2018 Excellence in Research Award to ten professors who have made significant contributions to their fields of expertise. SNU created the Excellence in Research Award in 2008 to inspire research efforts, and enhance the university’s research competitiveness. This semester, ten awardees were selected from a total of 27 nominated professors. Professor Kim Byung-Yeon (Department of Economics) established an empirical foundation for North Korean economic research, which was previously difficult to conduct due to lack of statistical data. Kim’s research is widely acknowledged as the most comprehensive and systematic analysis of the present day North Korean economy in the context of economic systems and transition economics. Professor Kim is currently serving as a member of executive committee of the Association for Comparative Economic Studies (ACES), the leading scholarly organization for the support of comparative economic studies. Professor Yi Youjae (College of Business Administration) established a theoretical foundation in the fields of customer satisfaction management and service marketing by developing several service-related indices such as the Korean Standard-Service Quality Index (KS-SQI), Public Customer Satisfaction Index (PCSI) and Seoul Service Index (SSI). He has authored more than 150 articles in leading academic journals such as Journal of Marketing Research, Journal of Consumer Research, Administrative Science Quarterly, Journal of Advertising, and Journal of Consumer Psychology. Previously, he served as the president of the Korean Marketing Association, Korean Society of Consumer Studies, and Service Marketing Association and is currently the Co-Editor for the Service Industries Journal. Professor Jang Jyongsik (College of Chemical and Biological Engineering) is leading research efforts in the biosensor field in Korea particularly through his work on flexible smart sensors and the production of polymer nanomaterials and functional carbon nanomaterials. He has published over 500 SCI papers and registered over 100 domestic and international patent applications. Professor Jang is currently on the editorial board of the Journal of Industrial Engineering &Chemistry and the Director of the Polymer Society of Korea. Professor Moon Il Kyung (Department of Industrial Engineering) has led research in areas such as production management, supply chain management, shipping logistics, and disaster management. He contributed to research in the field of international business strategies through developing economic management theories including the Generalized Double Diamond Model, Imbalance Theory, and the ABCD Model. 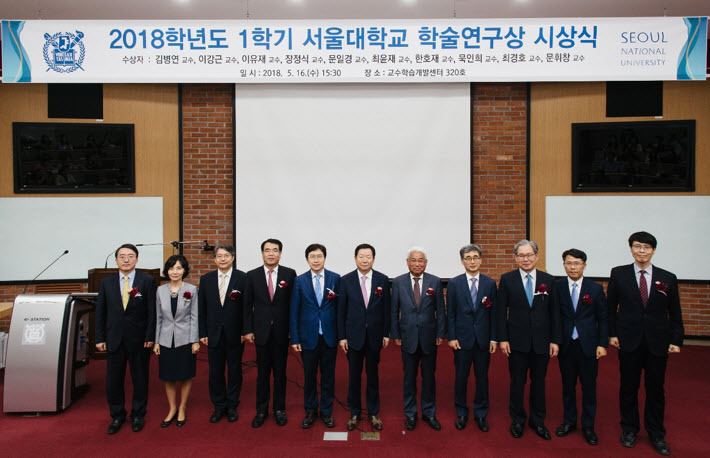 The first Asian to be elected as the Editor-in-Chief of European Journal of Industrial Engineering, he has become an inspiration for industrial engineers both in Korea and abroad. Currently, Professor Moon is serving as Vice President of the Korean Association of Industrial Engineers. Professor Choi Yunjaie (Department of Food and Animal Technology) has carried out a wide range of research ranging from the development of practical application technologies to the production of eco-friendly functional feed additives. His research has played an important role in introducing advanced technologies such as biotechnology and materials engineering to existing traditional livestock sector. He has published more than 200 SCI papers and registered 55 patent applications. Currently, Professor Choi is a member of the Ministry of Food, Agriculture, Forestry and Livestock and the Ministry of Science and Technology and is on the board of directors of the Korea Biotechnology and Industry Committee as well as the Korea Environmental Technology Promotion Agency. Professor Han Ho Jae (College of Veterinary Medicine) has led research efforts on cell therapy and bio-organ transplantation and the development of stem cell function technology. In October 2010, he was elected to join the Korean Academy of Science and Technology, Korea's highest academy of science and integrated science and technology think-tank. Currently, as head of the BK21 PLUS Vocational Training Center for Human Resources Development, Professor Han is leading initiatives to strengthen veterinary research by emphasizing close collaborations between graduate students, researchers and students. Professor Mook-Jung Inhee (Department of Biomedical Sciences) has contributed to research on the pathogenesis of Alzheimer's disease as well as the development of diagnostic markers for dementia. In 2016, Professor Mook was selected to join the Korean Academy of Science and Technology, Korea's leading science and technology think-tank, in recognition for her academic achievements. Alongside strengthening biomedical research and health innovation for Alzheimer’s disease, Professor Mook-Jung is leading research efforts in areas such as neurodegenerative diseases, proteomics, proteases, and brain aging. Professor Choi Kyongho (Graduate School of Public Health) has led research efforts in the fields of environmental toxicology and risk assessment. His research, which has resulted in more than 150 publications, has contributed to the development of technologies measuring the effects of exposure to toxins, chemicals and drugs. He is the associate editor of Toxics and is serving on the editorial board of a number of other major journals, including Environment International, Journal of Occupational Health, Environmental Health and Preventive Medicine, and International Journal of Hygiene. Currently, Professor Choi is the vice-president of Korean Society of Environmental Health, and a director of academic affairs of the Korea Public Health Association. Professor Moon Hwy-Chang (Graduate School of International Studies) has contributed to research in the field of international business strategies by developing and integrating economic management theories. His theories, including the Generalized Double Diamond Model, Imbalance Theory, and the ABCD Model, have been published by prestigious journals and publishers including Oxford University Press and Cambridge University Press. He has conducted consulting and research projects for several multinational companies, international organizations (APEC, World Bank, and UNCTAD), and governments (Malaysia, Dubai, Azerbaijan, and Guangdong Province of China). Currently, Professor Moon is the editor-in-chief of the Journal of International Business and Economy, an international academic journal.